I had been waiting and waiting until the asparagus turned up at the Farmers’ Market and last weekend it finally did. I had heard whispers and rumours that this fine vegetable had pushed its purple head through the soil but didn’t want to get my hopes up until I saw it with my own eyes. The first asparagus of the year I always find is the best. It comes at just the right time, after the snowdrops and daffodils have been out, as an indication that Spring has sprung. Its lovely flavour and delicacy has to be enjoyed, at least once in the short asparagus season, with the classic partner…Hollandaise sauce. I have perused many different Hollandaise recipes to try and find the tastiest yet least complex and time consuming. I certainly can’t be dealing with soaking white peppercorns in white wine vinegar for 2 hours. No. To me, Hollandaise should be buttery, creamy, ever so slightly sharp and only very complicated if someone else is making it. To make a Hollandaise without all the faff, get all the ingredients out and you’ll need and biceps like Popeye. Put a bowl over a pan of simmering water so that the bottom of the bowl and top of the water don’t touch. Keep the temperature as low as possible. First, put the egg yolks into the bowl and give them a quick whisk about. Cut a bit of butter off and whisk this in. Keep cutting bits off and adding it in until all the butter is incorporated. 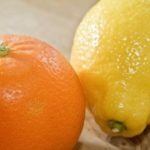 Squeeze in the lemon juice and drip the vinegar in until it has reached your desired acidity and then season. The sauce may look at first like really thick creamy Hollandaise but only about half the butter will be in at this stage so keep going. It might look like a whole bowl of melted butter near the end but if you take it off the heat once all the butter is added it will come back to a Hollandaise. 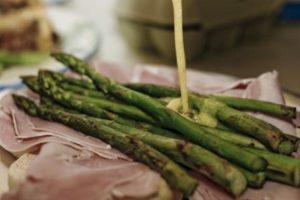 While the Hollandaise cools (or if you’re particularly good at multi-tasking, during the making) griddle the asparagus. The charred edges make this vegetable even nicer. I toasted some muffins, topped them with ham or smoked salmon, the asparagus and then poured the Hollandaise over the top. Such a classic dish but such a winner. What better way to celebrate this wonderful vegetable. 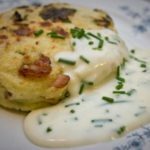 I made hollandaise last week, very similar simple recipe. Looks great with the asparagus. Isn’t it lovely they are back? This sauce is a perfect complement! Gorgeous! I’m only a little jealous. 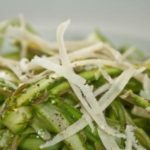 Asparagus will be here soon but until then I’ll be living vicariously through you and I’ll be bookmarking this recipe in the meantime. I haven’t seen asparagus at the farmers market yet … but I hope I do soon! This dish looks wonderful! 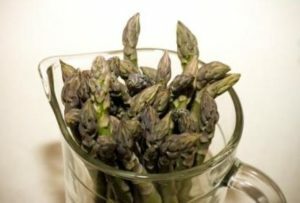 Love Hollandaise and Love asparagus (despite the after effects). Good shout on the popeye biceps, immense amounts of whisking required. We tried to make this sauce a couple times but I don’t think we got it right. I don’t know since I have not eaten anywhere else to be able to compare. I will try your recipe soon. I am sure we will like this! Thank you for your comments. 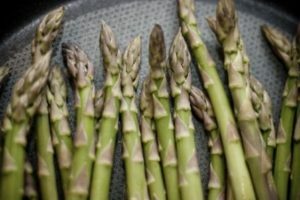 I hope you all enjoy asparagus for the short time it’s here.